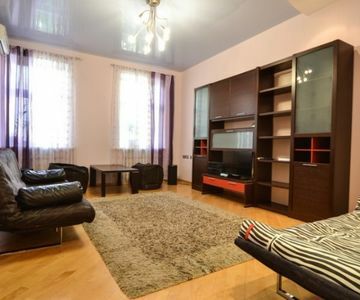 This apartment is one of the best options with a large quadrature,among provided in the real estate market in Kiev. 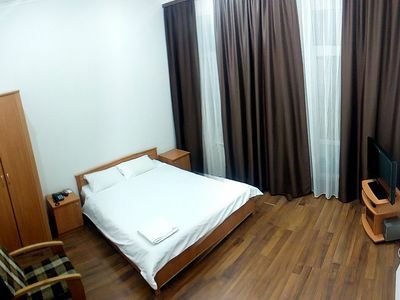 Situated in the heart of the capital, just a short walk from the main Khreschatyk street, and close to all the attractions of Kiev in the city center, the house is located near the presidential administration of Ukraine, security guard quarter. Numerous restaurants and Nightclubs located throughout the district, just a short walk from the apartment. 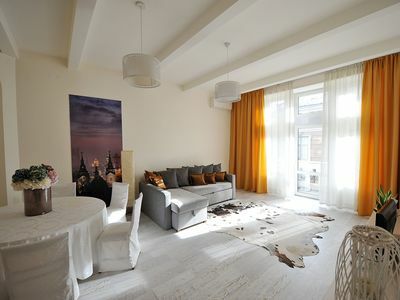 The apartment is on the 3rd floor of a 4 story building, it has everything necessary for your stay in the heart of Kiev. Repairs new completed in the end of 2104.Spacious living room with a 32-inch LCD TV, cable TV (over 100 channels including BBC, CNN, etc), home cinema with surround sound, DVD player, high-speed Internet with Wi Fi, each bedroom has a king bed, a spacious wardrobe, a fully equipped kitchen with a dining area for up to four persons, two bathrooms (Jacuzzi and shower), washing machine, two balconies with beautiful views of the city of Kiev, air conditioning and much more.Chic four bedroom apartment in the most prestigious location. Please observe these rules to avoid problems with residents and local police.